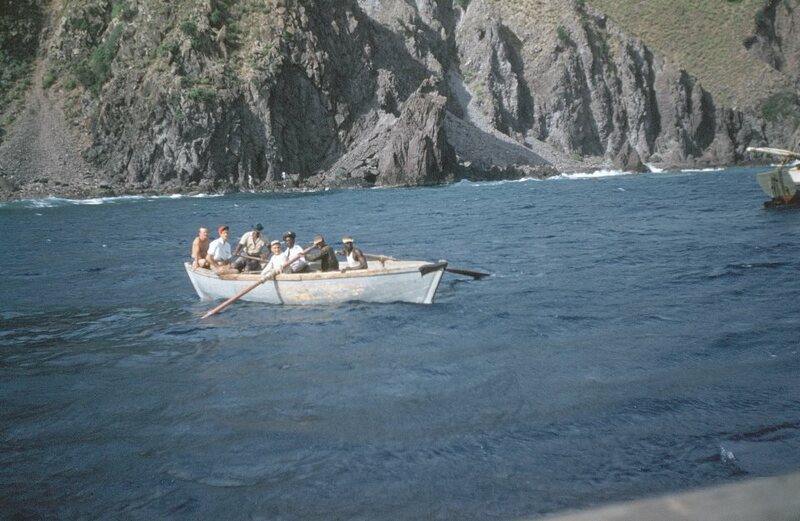 Sloop built by Bernard Lake for the merchant Joseph “Red Head Joe” Simmons at Fort Bay Saba early 1900’s. So much has been written on the subject of boat building on Saba over the centuries and so we decided to do our own research to determine as to whether or not these reports are based on myth or reality. Robert Louis Stevenson once wrote; “I should like to rise and go where the golden apples grow; where below another sky, Parrot islands anchored lie, and watched by cockatoos and goats, Lonely Crusoe’s building boats.” Perhaps he had the Saban boat builders in mind when he wrote this. In former times Saba acquired quite a reputation among travel writers especially in the United States. 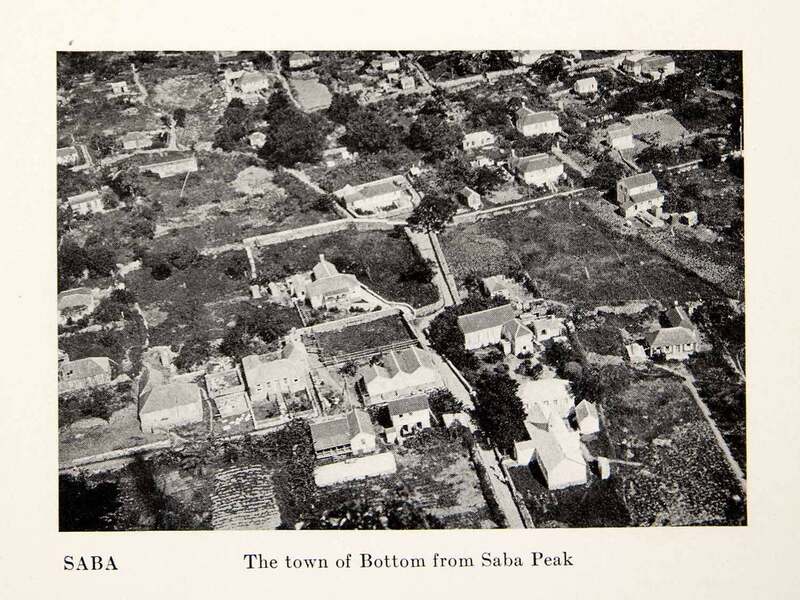 Although many of these writers had never stepped foot on Saba they managed to fabricate all kinds of stories about our island and its people. Newly built boat being taken down to the sea for launching 1956. One of the articles which prompted me to do this article was written by the author Douglas C. Pyle in his book “Clean Sweet Wind (1998)”. His research was based on a half day trip to the island in March 1970 and in talking to some people here and there. He writes: “Charles Stoddard, writing in 1895 in “Cruising among the Caribees,” represents the earliest reference I could locate of Saban vessels being built and lowered into the sea. However, neither Stoddard nor the others did anything more exacting than view the island from the deck of a passing cruise ship; their accounts merely establish that the hearsay evidence of boatbuilding in Saba is of greater antiquity than I had come to suppose. Leslie Johnson with his wife Adelina Hassell, Garvice Hassell and FOUR of the couple’s children in a boat he built at Upper Hell’s Gate 1800 feet above sea level. ‘As a matter of fact, the sole hard evidence ever found for the legend was Professor Doran’s discovery of a single entry in the Tortola shipping registers, mentioning that in 1859 the schooner “Augusta” of sixty-six-foot length overall and forty- nine tons was built in Saba by Benjamin Horton and brought to Tortola to be registered. 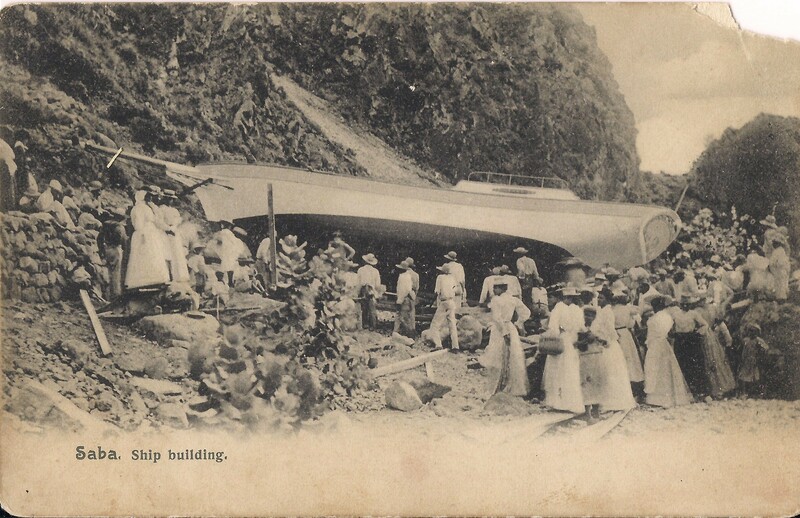 There were other vessels registered to a Saban owner and built elsewhere, but of all the entries I surveyed throughout the islands, no other vessel was actually attributed to construction in Saba. 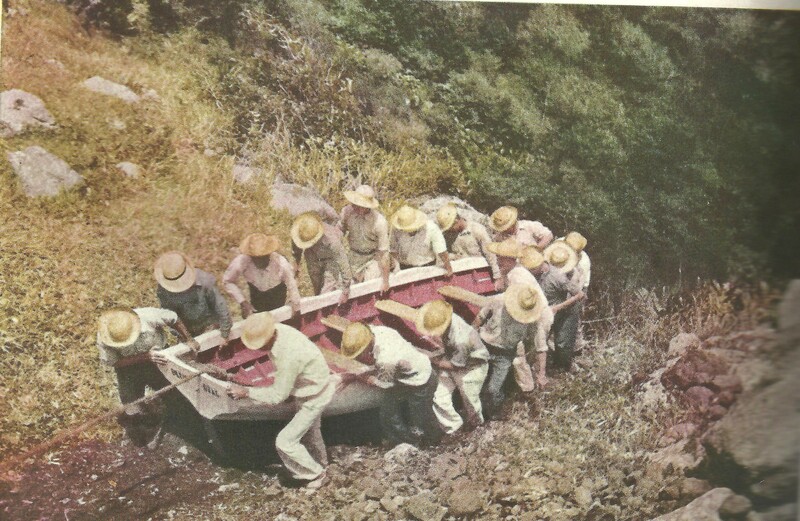 National Geographic Magazine paid to have this demonstration of taking a boat down to the sea, late 1930’s. Kenneth Peterson building a large fishing boat in Windwardside “The Five Sisters.” early 1960’s. Leslie Johnson with his son Kenneth building a large fishing boat in Upper Hells Gate 1960,s. “Living aloft in their volcano, in a summit city called Bottom, these simple Dutch people who speak English reach the extreme of the improbable in the nature of their staple industry. They do not make balloons or kites. They are not astronomers, nor are they engaged in extracting nitrogen from the atmosphere. They are of all things in the world, shipbuilders, and shipbuilders of such merit that their boats and small craft are famous all over the Windward Islands. Let it be noted that fishing smacks are not only built in a crater, but on an island which has neither beach, harbor, landing stage, nor safe anchoring ground, where no timber is produced, where no iron is found, and where cordage is not made. The island has indeed, except in the matter of size, no more facilities for the development of the shipbuilding trade than has a rock lighthouse. The production of ships from craters is hardly less wonderful than the gathering of grapes from thorns or figs from thistles. 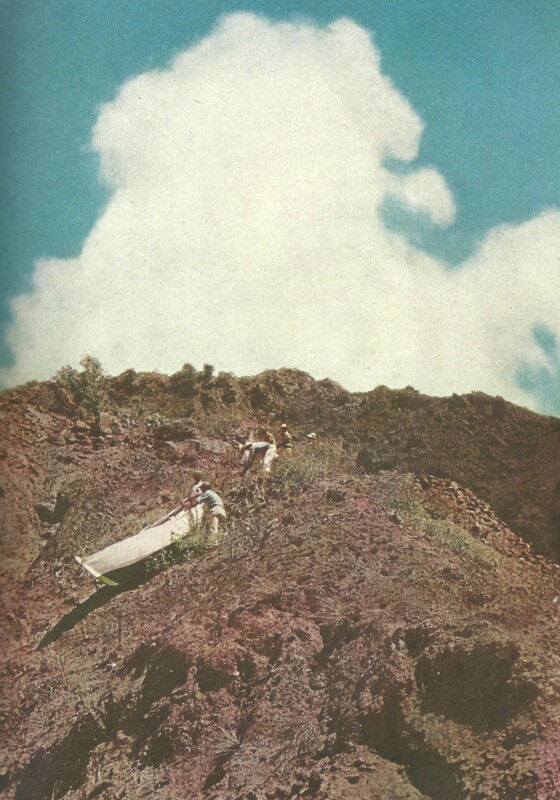 The National Geographic Magazine in the late 1930’s paid to have this fictional launching of a boat on the Clapper Cliff at Windwardside. 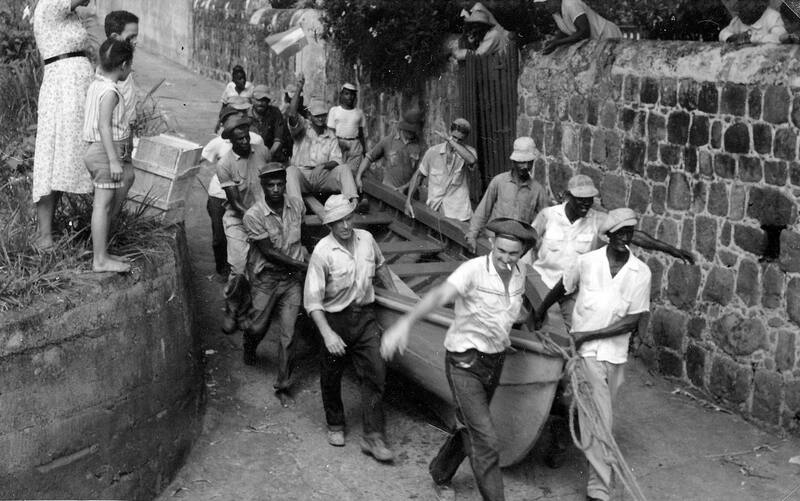 All of the lighter boats which brought cargo and passengers to shore on Saba were all built locally and very strong so as to manage the rough seas and rocky shores. In the November 1940 issue of the National Geographic Magazine there is a long article on Saba written by Charles W. Herbert. He had visited Saba some years earlier and had made a film about the island. He writes: ‘Anyone who has heard of Saba remembers tales of early Sabans most widely broadcast is that fantastic story of shipbuilding. Almost without exception, when Saba is mentioned, they will say, “Oh yes! That is the place where they build schooners on top of the mountain and lower them over the cliff by ropes, down into the sea. If schooners were ever built in Saba, they were built on one of the narrow strips of shore close to the sea. 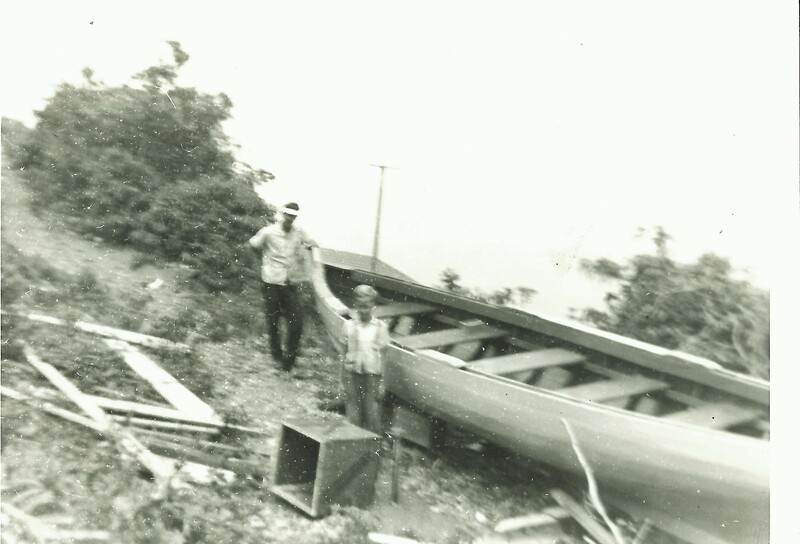 Jose Wilson uncle of the well known Mr. Elmer Linzey, here giving Leslie Johnson a hand with the building of his boat at the Fort Bay. Leslie Johnson’s boat framed out. The Saba white cedar wood was used in the building of these boats in former times. And there was so much more written about the myth of boatbuilding on Saba that we can only quote from a very few writers on this subject. However in doing research for my book “Tales from My Grandmother’s Pipe”, I was able to determine that large schooners were indeed built on Saba. They were built on the Tent Bay as well as at the Well’s Bay. Some were as big as 60 tons. 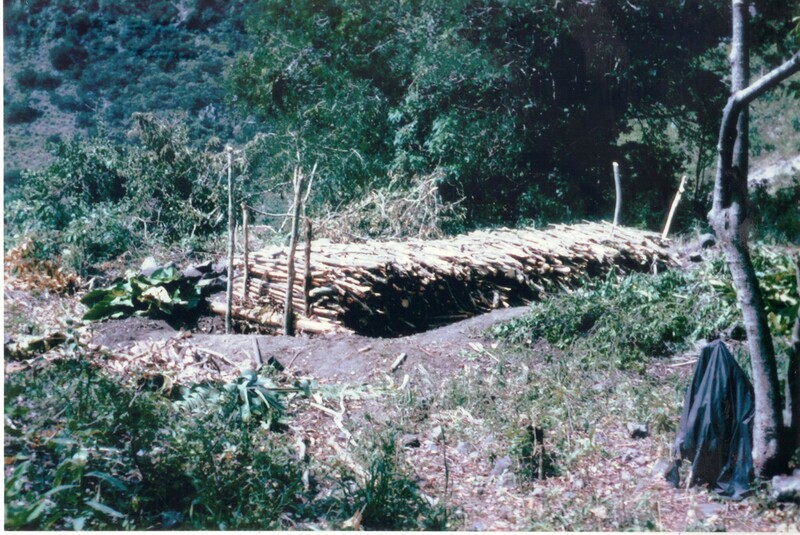 There was a large quantity of white cedar and mahogany trees on the island. Even people from Anguilla would come here to get white cedar to build boats with. In order to launch the schooners and sloops the rollers would be greased with the juices of cactus and aloes. Some of the schooners and sloops built here were named the “White Wing”, the “Talent”, the “Surprise,” the “Ethel” owned by Joe Simmons and the “Muriel” owned by John Simmons. One of the famous shipwrights of his day was Capt. 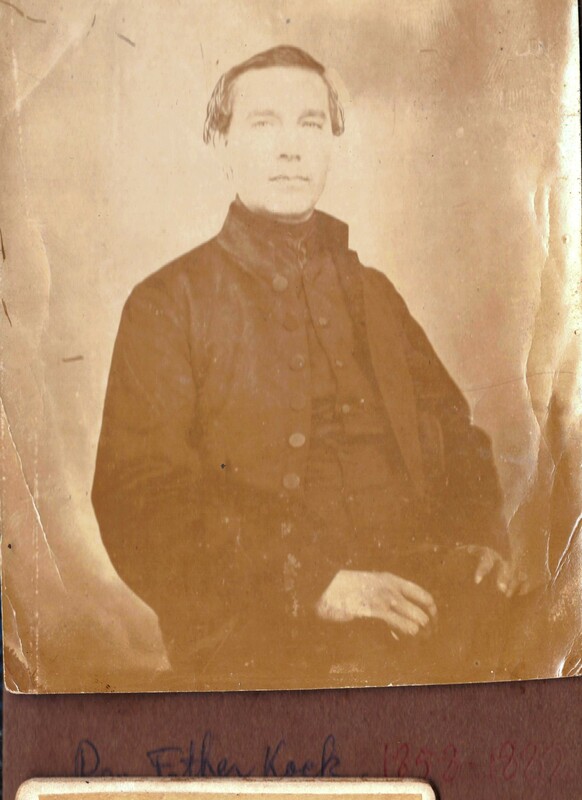 Solomon (or Samuel) Simmons. 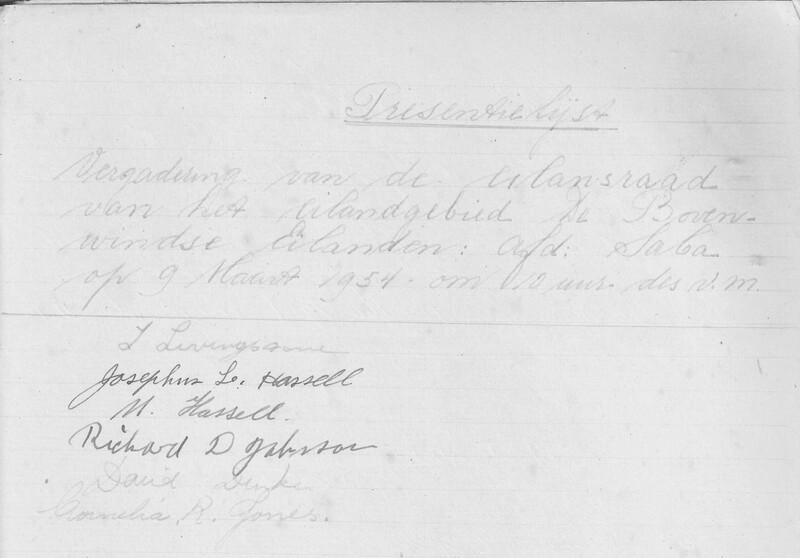 The following declaration dated September 22nd, 1871, gives more information on one of the schooners built on Saba. The “Harbinger” was sold in 1890 in Colombia and renamed the “Segunda Maria”. As late as 1930 she was seen in Curacao by Capt. Randolph Duncan, loading goods for Colombia. 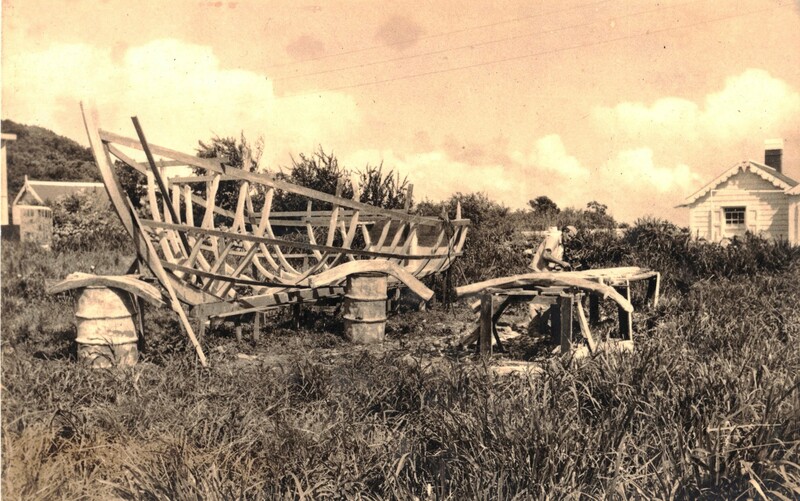 For a schooner to last that long it is a Grand testimony to the shipbuilding skills of Sabans back in the day. This is not the one, but there was a joke about one of the old timers living at the Gap. He had a large cellar and it was a convenient place to build a boat he thought. When it was nearly finished a cousin came to see it and asked:’How are you going to get it out?’ The entrance was too narrow and the poor man had never given thought to what would happen after it was finished. 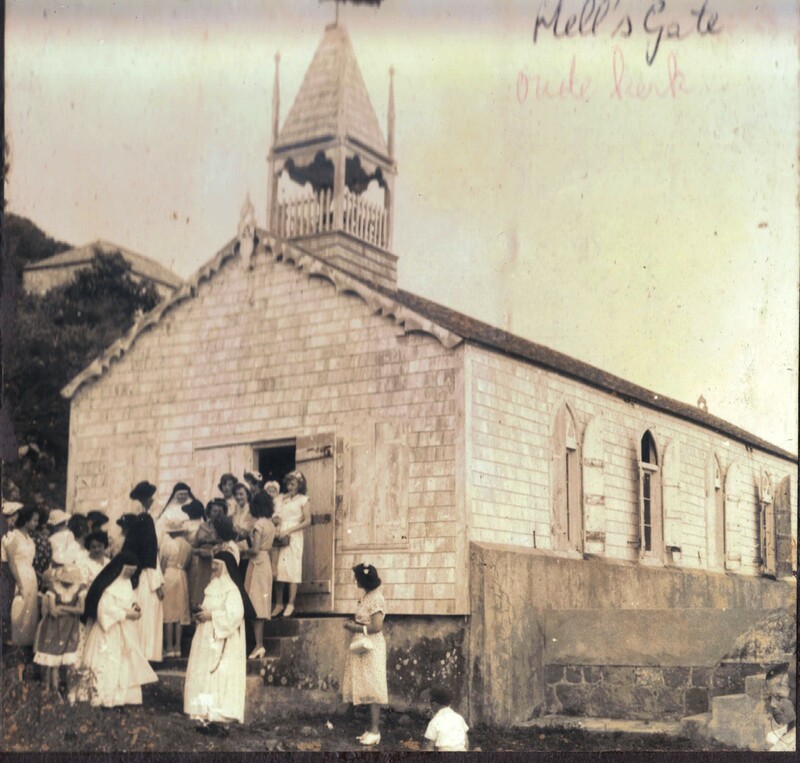 Up until recent time’s boats were still being built in Windward Side and Hell’s Gate. Arthur Anslyn built one and sent it to Curacao. 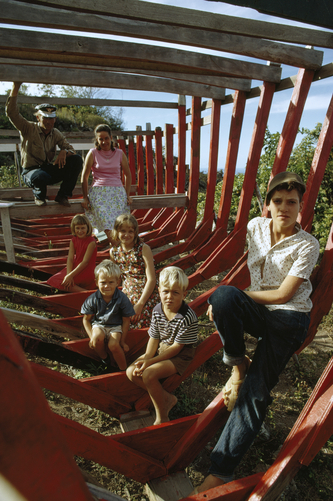 Leslie Johnson built several large fishing boats at Hell’s Gate one of which is pictured in a National Geographic Magazine with him and his family. In recent years the fishermen who go down to the sea to brave the rough waters do so in modern fishing craft which they purchase in the United States and Canada at prices their forefathers would never have imagined possible. 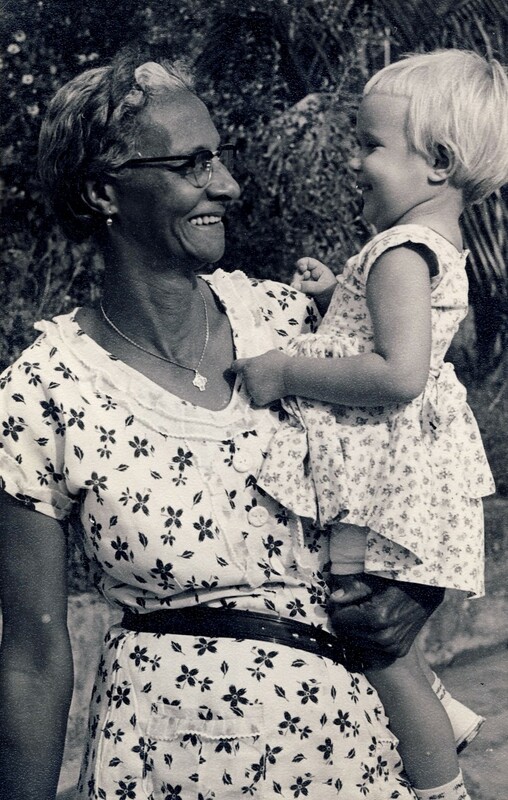 Miss Olive was born on Saba on September 16th, 1891 of a sea faring family. James Leslie Johnson here finishing up his fishing boat the the Fort Bay. Let me suffice with ending this story by quoting from Frederick A. Ober who spent some ten days here on Saba around 1890.It is taken from his book “In the wake of Columbus”. On the other hand some became more cautious. Carlton Mitchell in “Caribbean Cruise” got the following answer when he asked a young man why he had left the sea to work in the Post office. The young man in return asked him:’ did you ever hear of anyone drowning in the Post Office?” And so I guess after the captains left the island for Barbados, Bermuda, and the United States and so on, most people who remained here decided that a government job was safer and so our shipbuilding of the past would seem like a myth to the mindset of today. 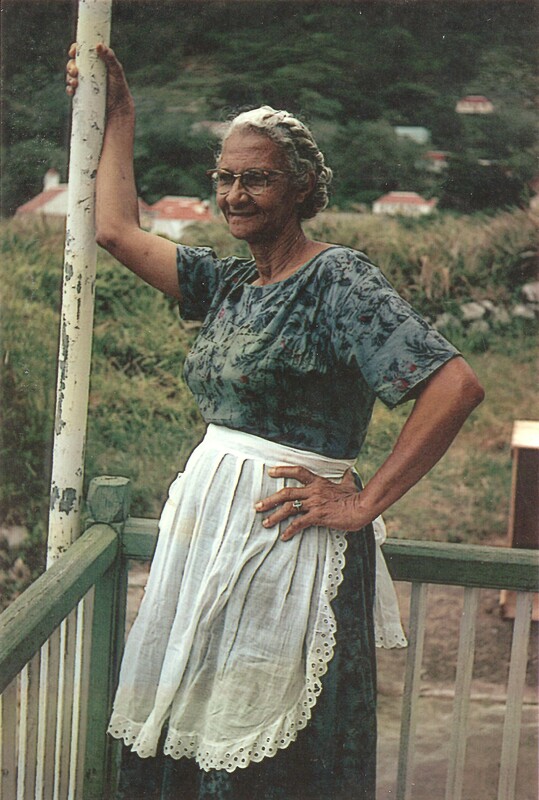 Miss Cornelia Jones First Woman Member of the Island Council. Miss Cornelia Jones at the Windwardside Guesthouse. 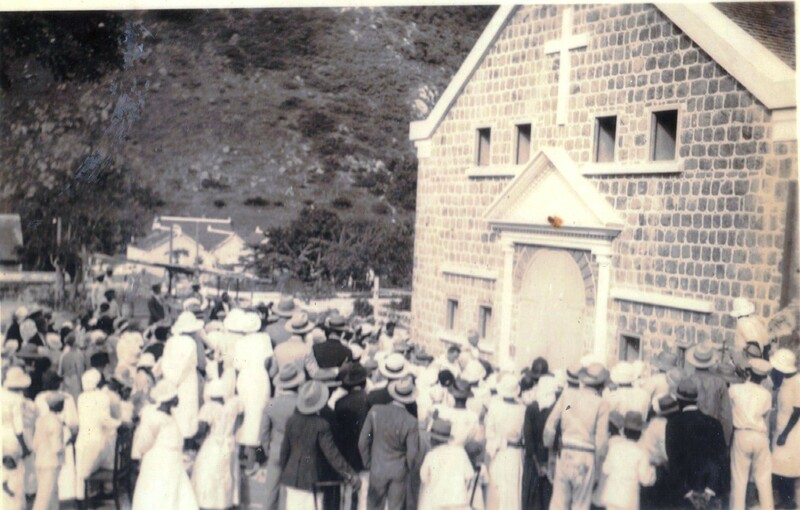 Miss Cornelia Rosina Jones was born on September 10th, 1907, at St. John’s, Saba. She was born from a mixed marriage, something not unusual in the history of the village of St. John’s. Her father was a black man, Fernandus Jones born on June 2nd, 1877 and he died on December 22nd, 1943. He and Frederick Zagers and a number of other men were lost when a storm came up while they were fishing on a small boat out on the Saba Bank.His parents were George Jones and Sarah Stevens. Her mother was a white woman named Mary Jane Hassell( who died on November 13th, 1954) of whom I did not find any more records, but I remember her personally as a boy. Miss Jones’ Home here overlooking The Bottom. 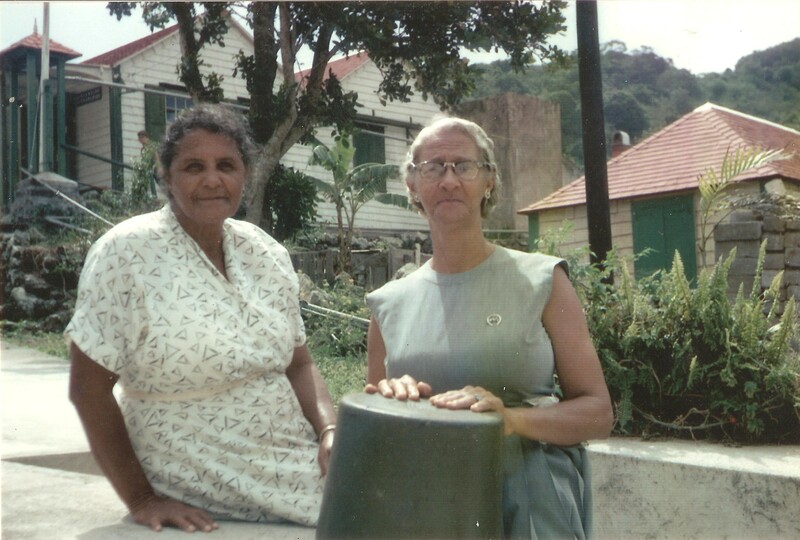 In 1951 Miss Jones together with two other females Mrs. Ursula Dunkin-Hughes and Mrs. Millicent L.Wilson, born Simmons, (grandmother of present Island Councilmember the Hon. Rolando Wilson). Miss Jones got 0 votes, Ursula got 4 and Miss Millie got 4. Island council members attendance list. in front of guesthouse. 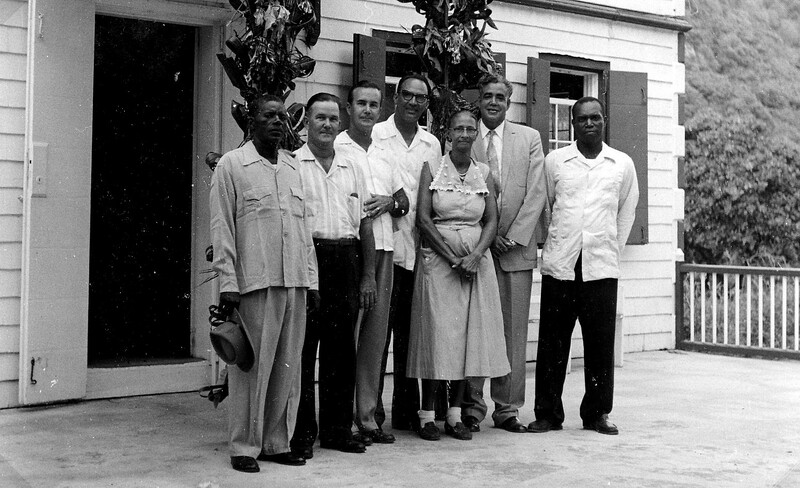 Mr. Rupert Sorton, Mr. Arthur Anslyn, Mr. Carl Anslyn, Mr.Ciro Kroon, Miss Cornelia Jones, Administrator Walter Buncamper, Mr. Matthew Levenston. 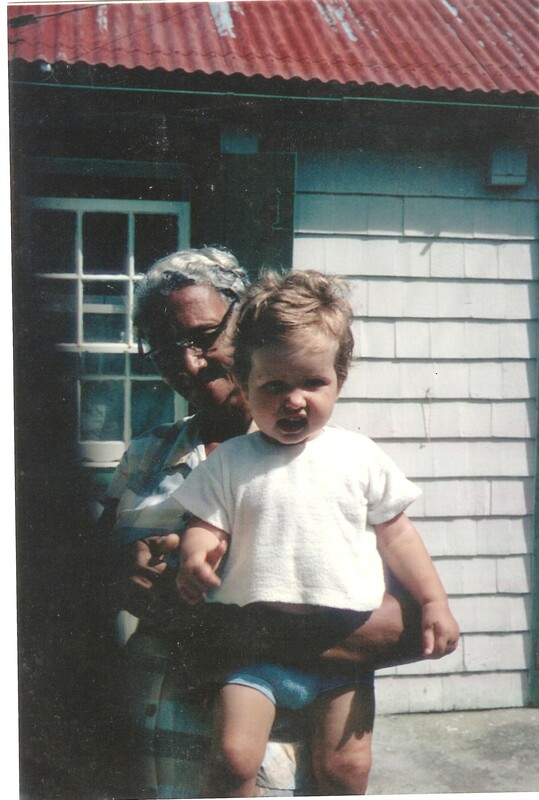 Another photo of Miss Cornelia Jones with one of the little people whom she loved. Although she had no children of her own she loved the little people as only a grandmother could. Miss Jones was a Roman Catholic. She never married or had any children, but several of the photo’s which I have of her she is always seen holding a child as lovingly as any grandmother could. I found a conch shell close by and I placed it on the grave while giving Miss Jones a talking to that her memory would not be forgotten. She died on December 23rd, 1979 at the age of 72. I later dug up the information in the “Saba Herald” and found out also that she had been given a decoration by Her Majesty the Queen for her many years of service to the island of her birth. I only hope that someone who cares for history will end up owning the property and will see to it that Miss Jones and her family will rest in peace. Amen. Speech for the opening of Saba Health Care Foundation Administration Building, February 21st, 2014. Will Johnson making speech as honoured guest. When asked to say a few words for this occasion I reflected on how much health care has changed in recent years. It is no longer necessary for the government to call on President Hugo Chavez to help send three patients to St. Maarten as I had to do once. Saba’s total budget for a long time was 3.5 million guilders with another million or so collected locally. After putting up an enormous fight the grant from the Solidarity Fund was increased to around seven million a year. However one must remember that the Saba Island Government had to finance not only health care but education, fire department, tax department, receiver’s office and many other things which are now financed by the Government of the Netherlands. Monetary wise this has been a very positive development for the island since our new status went into effect. My party started running the government of this island since 1971. Back then we were part of the Island Territory the Windward Islands. I remember once walking into the Receivers Office and Kenneth Peterson slamming his fist on his desk saying; ‘Two thousand guilders more would do it and we will never need Curacao again. At that time we were running the island with a budget of fls.28.000.—per month. 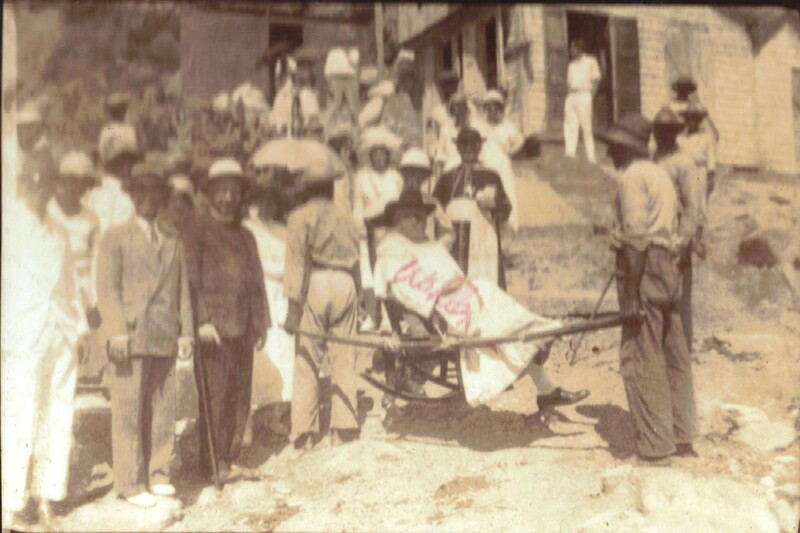 When we look back in history there were long periods when Saba did not even have a doctor, but when we had one there were locals doctors such as Dr. Dinzey in the early eighteen hundreds. 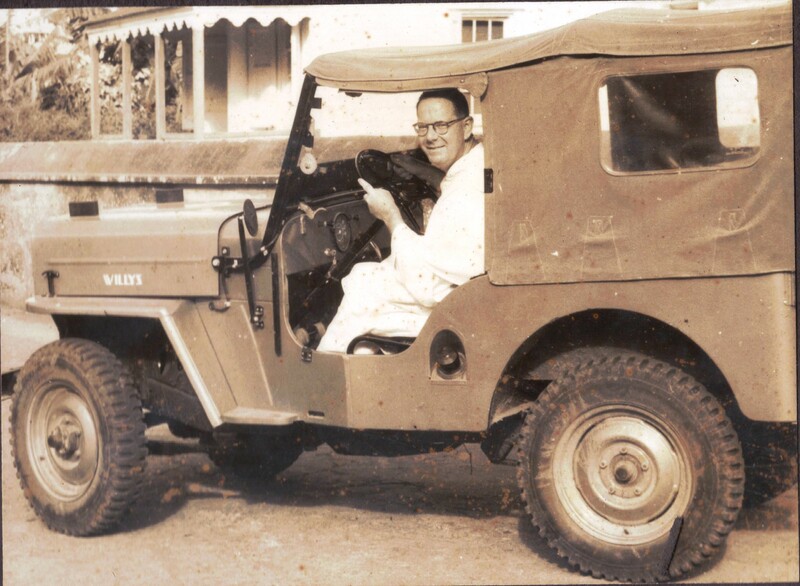 For those interested in doing further research into the history of Medical Services and Care on Saba I would suggest that they read Dr. Robert Mol’s book entitled “Doctor on Saba”. 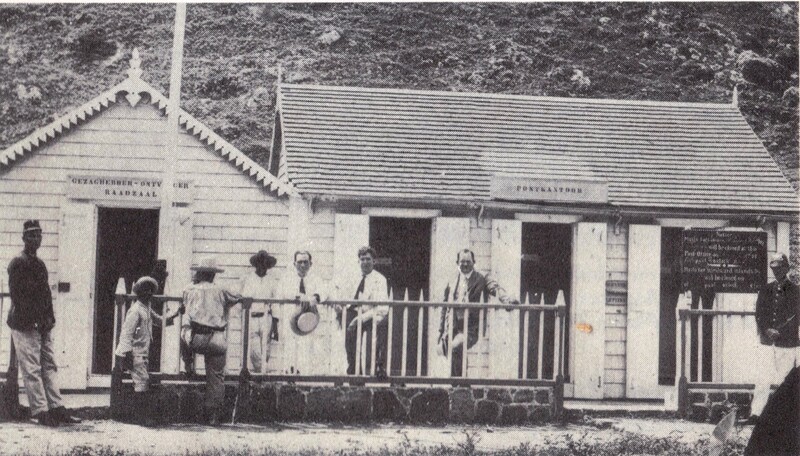 A very indebt history of medical care on Saba, through the centuries. I also recently wrote an article in my column “Under the Sea Grape Tree” about Nurse Lizzie Hassell born Doncker and her nursing career in which she gave much information on her career as a Nurse and the doctors she served under. I am looking forward to the day when Nurse Naomi Wilson writes her own book as that should be of a great deal of interest to the new generation of people seeking medical care. 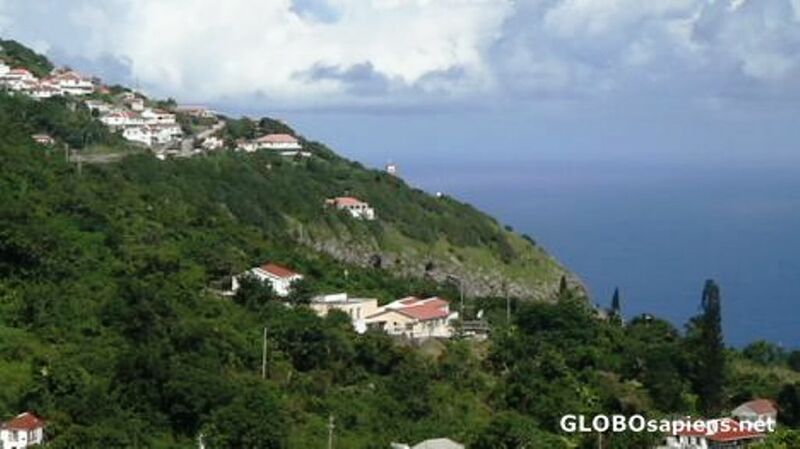 In about 1818, the then Commander of the island of St. Maarten and Saba wrote in a report, “generally the air on these islands and in particular on Saba is very clear and the climate is healthier than on the other islands of the Antilles. 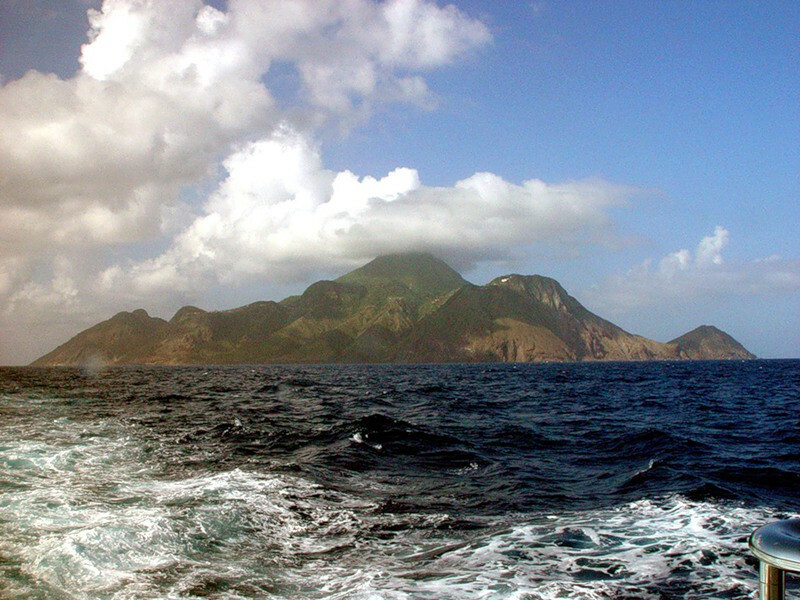 The first case of leprosy on Saba was seen in 1840 and was probably imported from St. kitts. 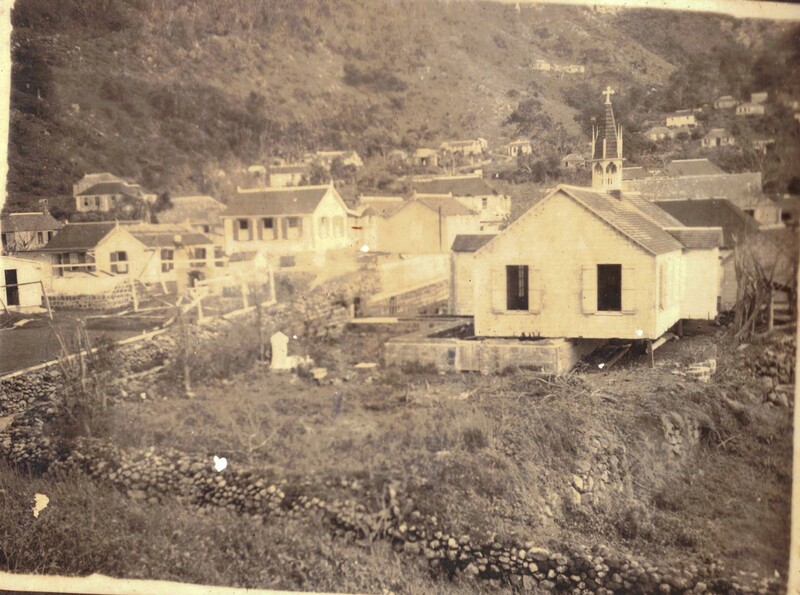 Saba’s population increased from 1883 persons in 1890 to 2488 in 1915, 99.9% of whom had ancestors going back to living here from the early sixteen hundreds. Except for a few periods in the early nineteen hundreds Saba has always had an on island physician. Some of these took bold moves to save the lives of their patients. I just wrote a story about a former slave girl who at the age of fifty had both legs amputated and yet she lived to the age of 102. There was no anesthesia back then so the patient was loaded up with a bottle of strong rum called “kill devil” and the butcher with his sharpened hatchet would do what had to be done. She survived and with the care of her three daughters she lived to be 102 and died in 1954. Later on when Dr.M.W.R.B. Berkenveld of Surinam was doctor here he would do appendicitis operations. This doctoring business had its scandals attached to it as well. Since they happened more than one hundred years ago I will mention but two cases. A friend of mine would tell me that the doctor had taken advantage of her mother when she went to visit him. I asked her:”What happened?” “Me”, she answered. 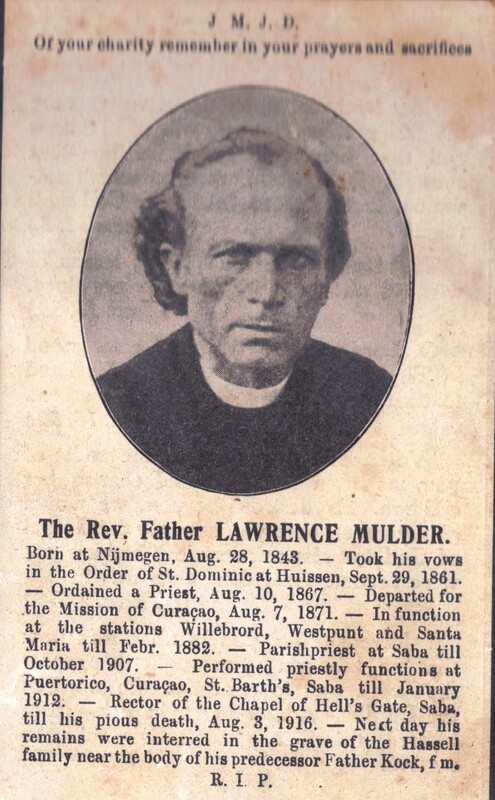 His photo is in Dr. Mol’s book and a noble looking doctor he was. Another friend’s mother went to the doctor and while waiting on him, the doctor’s son had his way with her and this resulted in a daughter. This one has always intrigued me ‘Was she really ill? “In those old wooden houses how did he pull that one off without his father knowing what was going on in the waiting room, which would have been the hall of his home. Mysteries yet to be solved for someone like me so interested in history. As for the history of this building, it goes along with the growth of government over the years. 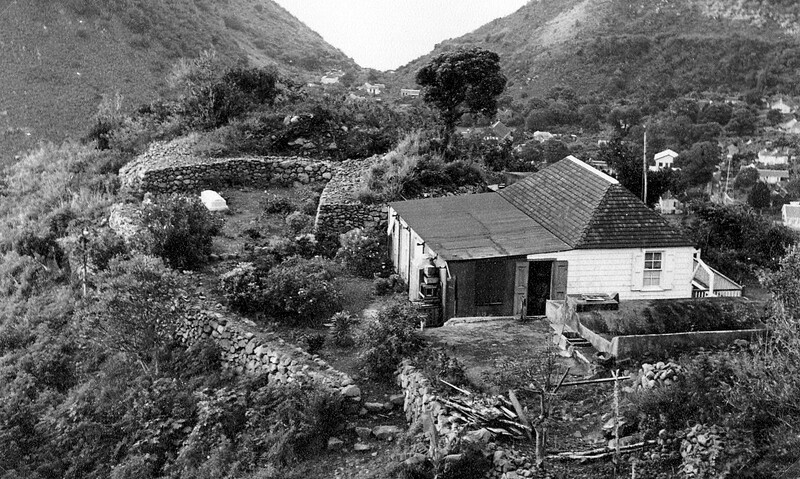 Up until around 1890 the Commander of Saba would use his home as his office and if need be his cellar was used as a jail. There were no government services as such. Once a year in my grandfather James Horton Simmons’ time the able bodied men of the island were called up to clean the public pathways. They were paid either five cents in cash or the equivalent in rum or tobacco. Horton chose the five cents of course as he had a flock of daughters who at the time were considered useless as it was thought they could not run behind a goat and catch it or go fishing on the Saba Bank and so on. View of Police station and Post office 1920’s. Photo 1925. 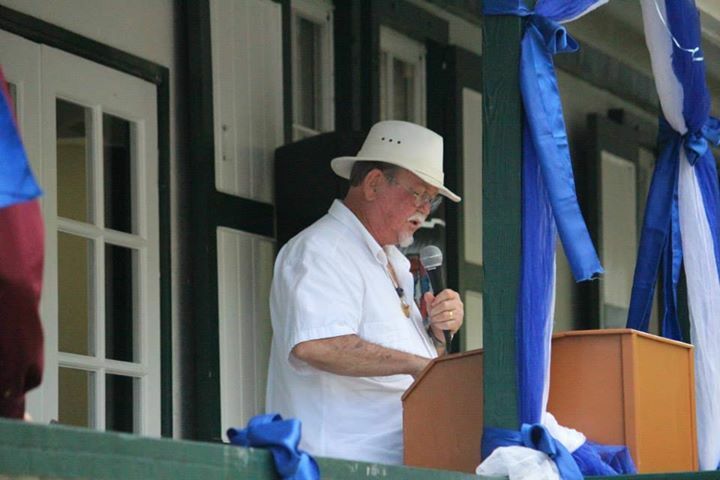 Administrator WFM Lampe holding straw hat. Left policeman Bentley Heyliger of St.Eustatius and right policeman George Halley of St.Martin. 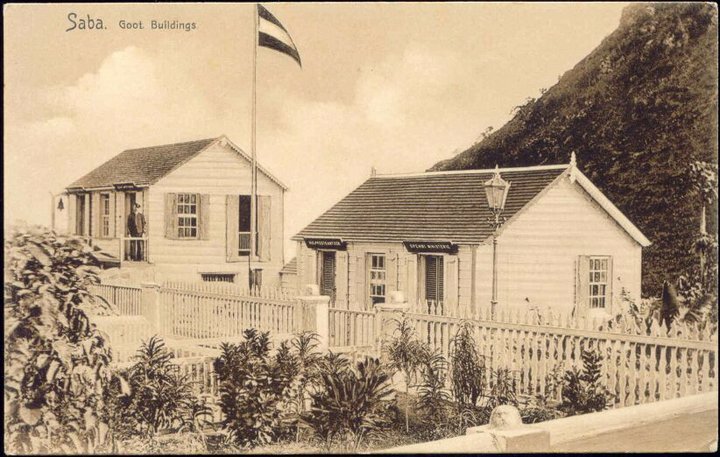 I have a photo of the first government buildings on this street which consisted of a police station with some prison cells underneath and what is the Culture building now was the Post office and Administration building. I have photos of when it was in use with Policemen and the Public standing outside of the building. Around 1934 there was quite a bit of government construction going on, and so it was decided to construct this building to serve as Post office, Court Hall and office of the Administrator and his small staff. In the early sixties an addition was made to house the Commissioners. This building has seen many joyous occasions like weddings and inscription of births, and also sad ones when people had to appear in front of the Judge. When I was a boy there were no movies and so, on the days when the Judge would be on island you would see scores of people headed to this building to hear cases which would be very entertaining. The English Quarter people even had their own lawyer in the person of Peter Parrot. Town of The Bottom around 1923. He once advised a client that before the Judge throws his hammer on the desk and condemns you, throw yourself on your knees and beg mercy in the name of the Queen and he cannot refuse you. This happened and the Judge was flabbergasted as in case he did not grant mercy in the name of the Queen it would make her look small and so the case was dismissed. I was present the last time Cecil Woods appeared before the Judge. He liked his rum and his cases were always one of drunk and disorderly conduct. The Judge looked at his record and said;”Cecil, I have to make a decision as you have been here so many times. I will have to either give you two weeks in jail or fine you fl.30.—“Cecil said “Your Honour let me think about it.” After thinking Cecil said “I will take the two weeks, Your Honour. Thirty guilders can buy me a whole lot of rum.” Even the Judge had to laugh at that one. The Island Council also used to meet in this building in the Court Hall. 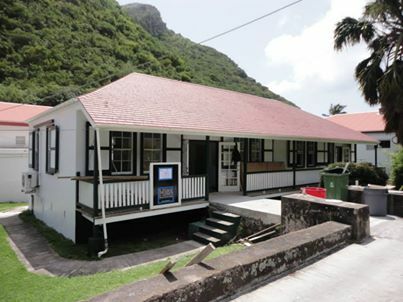 I served in this building for a few months in 1962 when I was sent here from St. Maarten to work in the Post office and to campaign for Claude Wathey at the same time. In later years I served here as Commissioner and Administrator, and Island Council Member. Many well known politicians in former times passed through this building, like Kenneth Peterson, David Donker, Matthew Levenstone, Max Nicholson, Arthur Anslyn and a number of others. People who worked here in the Receivers and Post office were my brothers Eric and Guy, Ramon Hassell, Carmen Medero and so on. Administrators like Henry Every, Eugenius Johnson, George Sleeswijk and George Larmonie and many more. When Dave Levenstone would get on too rude I would exile him to this building as well. It was on my watch in 1981 that we decided to build a new Administration Building at its present location. This building was then converted into a library. The other concrete building which was incorporated in the Home for the Aged was built as a Home for the Receiver, but was later used by the Administrator when the present Lt. Governor’s home was under reconstruction. 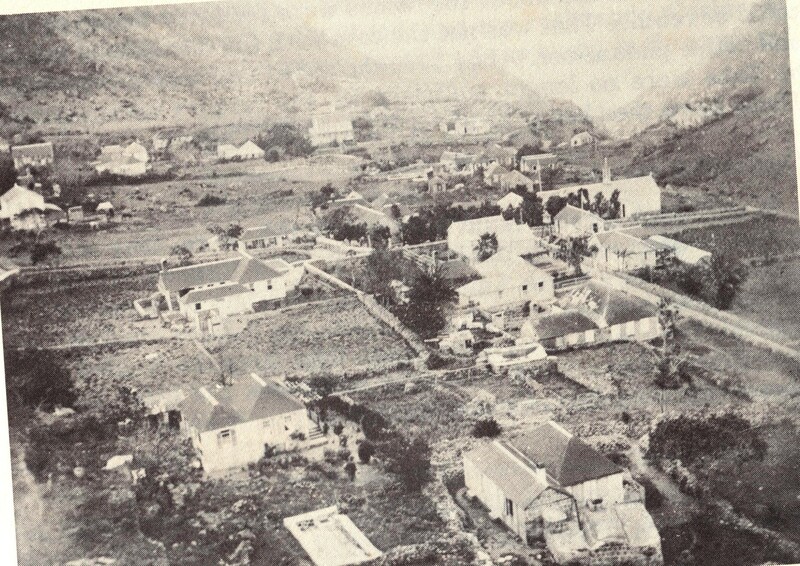 Where all of these buildings are now located was used as farm lands by the Simmons family, one of the former white families who owned nearly all of The Bottom and who in the nineteen twenties moved to Barbados, Bermuda and the United States. I have old photos showing the land farmed out. Princess Irene Hospital St. John’s. As Commissioner I made a decision in 1977 to relocate the hospital to The Bottom. I remember as if today discussing with architect Raymond Peterson the need to relocate the hospital in my office when I was Administrator/Commissioner in 1977. Eugenius in passing through my office had no qualms about taking a letter out of my hands and reading it. So it was that day when he overheard my discussion. At the time there was a government garage on the property and the area was littered with some old wrecks of Jeeps which was the vehicle of choice back then. Eugenius said;”Put it here and get rid of that old garage.” I asked Peterson to make some measurements and he said there was enough room and in a few months time we started the hospital with Public Works and Howard Johnson as foreman. He had also been foreman for the Home for the Aged and we also built that with Public Works. By the way Howard was paid thirty guilders a day. Even though he was Eugenius’ brother I fired him when work slowed down on the hospital in 1978 and I then hired Franklin Johnson to complete the project.I remember with deep remorse the night Howards sister Loreen called me and said “My God, Will of all people you to fire poor Howard? ?” The old age home we built for 450.000 guilders and furnished it as well and the hospital’s total costs including furnishing was around one million three hundred thousand guilders, probably less than what has been spent on the reconstruction of this building. Newly restored old Administration Building 2014. Now Administration Centre Health Care. I would like to express my thanks for being invited to say a few words here today on this grand occasion. I have also made suggestions to relocate the Home for the Aged to a location where they can enjoy a “Room with a View.” This entire complex can then be used as a hospital and I am really looking forward to the day when that will take place. 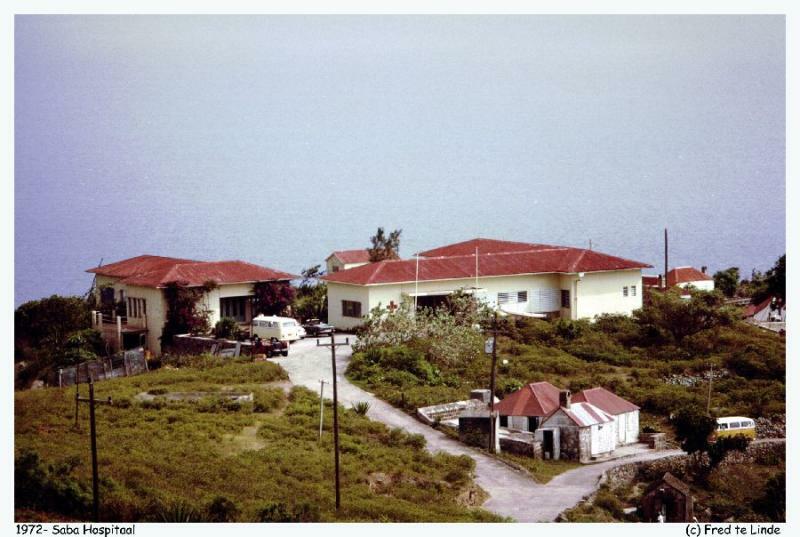 Many people in the nineteen seventies contributed funds to the Saba Benevolent Foundation in order to make this facility a reality. The time has again come to put out the begging bowl, and start a collection for a new home for the aged in a better location. May this office building continue its historic role of guidance and service to the people of Saba. Just like a child at play. And reached into the ocean for rocks a mile high. to make it look like home. Then to add a happy note. and called it a mountain goat. it’s too quiet in this place. This poem brought a response from an Anonymous Saban. We’ll drift along with the tide. Doves answer “Hoooome sweet Hoooome”. 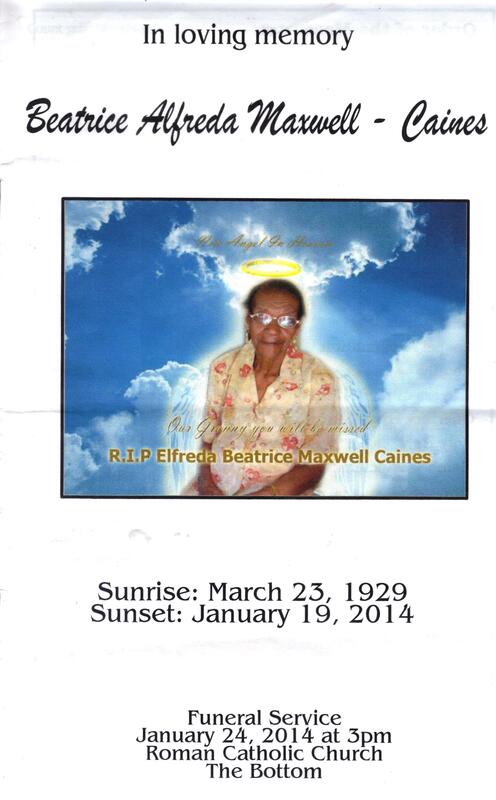 The late “Freda” Caines was a great friend of mine since I can remember. As a matter of fact I also knew her father Mozes quite well. 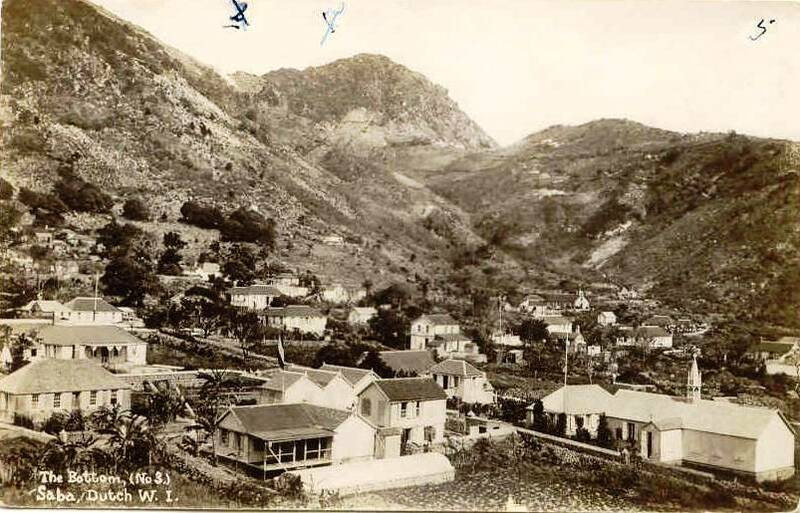 The Maxwells were a black family who lived in an area above Windwardside in the mountain just below where the Chinese restaurant is now located. This settlement dates back to the times of slavery and it was called “The Alley”. 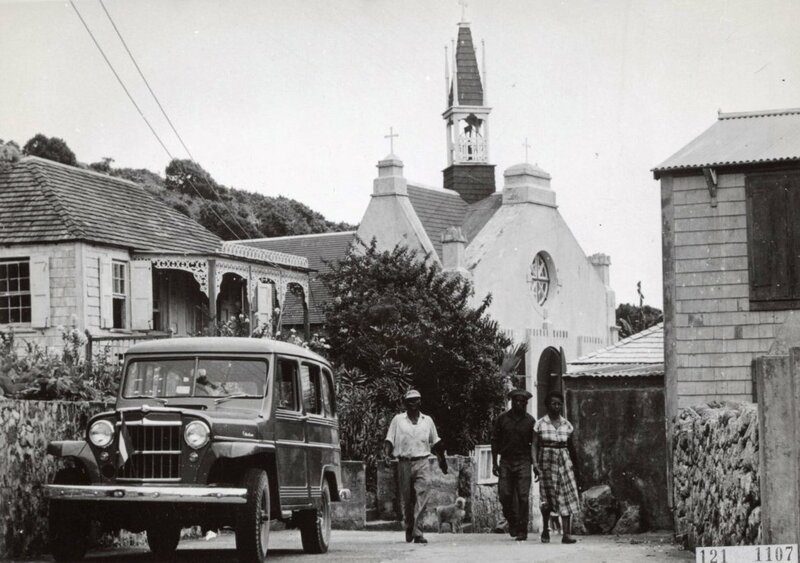 It has completely disappeared now in the sense that the former houses and lands of the few black families who lived there have all been sold and are now occupied by other families from Saba as well as abroad. It was customary back in slavery times and following for landowners on Saba to allow their slaves to live on lands which remained untitled. After slavery was abolished a second and third generation were allowed to live on these lands, but the ownership of the land remained in the hands of the former slave owners and upon the death of the occupants of the small houses the owners reclaimed the land and the small houses were demolished and later on sold . My friend ‘Freda’ was born as Beatrice Alfreda Maxwell in the English Quarter on March 23, 1929 and passed away on January 19th, 2014. Her parents were Mozes Jackson Maxwell and Violeta Gonzalos Hassell. She grew up on Saba and went to school with the Nuns at the Roman Catholic school in Windwardside. There were no job opportunities back then so you were lucky if someone asked you to do housework for them and get a five or if lucky a ten guilders per month. Freeda later on got a small job cleaning the Post office and Police station in the Windwardside. Alvin must have been going through a mid life crisis when he met a young Surinam nurse who fell in love with both his music and him. When she left the island Alvin abandoned home and family and went on what the Australians would call a ‘walkabout’ to Surinam and after the relationship cooled he ended up in St. Thomas and the British Virgin islands. Years later he wrote my father a letter asking him to speak to ‘Freda’ and ask for her forgiveness and to consider taking him back. She did not hesitate as he was not only father of her four children but she needed help and he had been a good provider when they had lived in harmony. And so the wayward boy came back home and he and ‘Freda’ lived in harmony until he passed away. 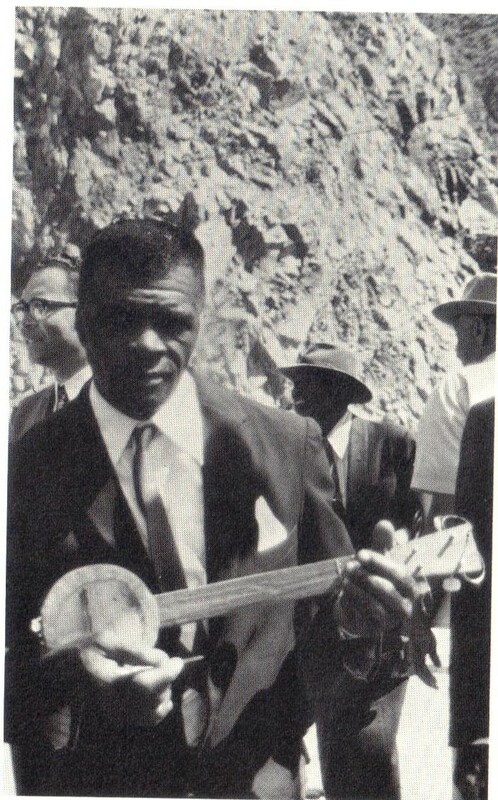 While Alvin was on his ‘walkabout’ you can imagine how tough it was for a single (English Quarter),mother to raise her children, and so she had an additional four children while he was a wandering minstrel to the ladies of Surinam and the other Caribbean region. When Alvin returned they were able to build a nice home in the English Quarter on the same spot where her parents house was located. In the meantime the children had become adults and were working and could help her. They were a close knit family and were aware of the hardships their mother had gone through in order to raise them and so up until her death they remained faithful to her and helped whenever they could. My relationship with her was always one of close friends. As for the politics between 1969 and 2010 when I last ran I never had to wonder where ‘Freda’ would vote. She always voted for me and would even ask for ‘help’ to erase any doubt. And would be there to help celebrate victory and regret defeat and would tell me. Don’t worry you will win next time for sure. And I did. I went to see her when she was in the Home for the aged, but not enough. My schedule is still a busy one. A few days before I left the island for a meeting in Bonaire I was at the hospital and took the opportunity to go and see her but I was told that she was asleep and so I did not bother her. I felt relieved when her granddaughter Shirley who travelled with me to Curacao told me at the airport there that she had good hopes for her grandmother and that she would be still there when I got back home. The very next morning I got a message from Shirley that ‘Freeda’ had passed on. Her son Stevan asked me to do the eulogy but my I-pad would go haywire and just delete whatever I wrote, so finally I told him that I was sorry that I could not contribute. But I did promise myself that I would do a tribute to her and her family as soon as I got the opportunity. Shirley asked me to give some of the family history which I will do in part and give an internet site where further information can be obtained. 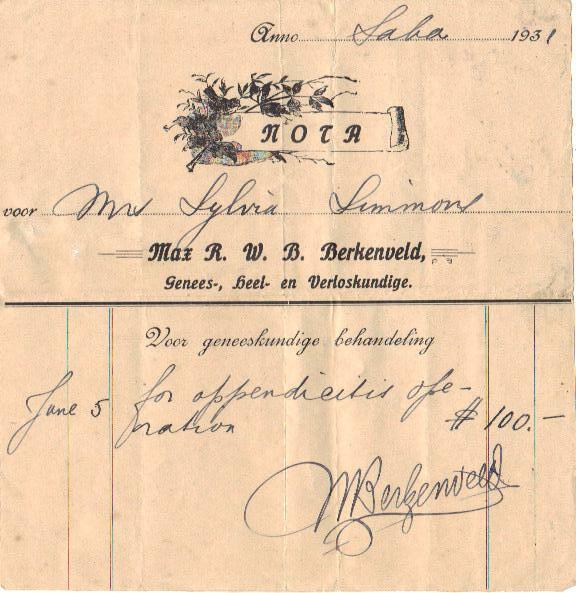 Freda’s father Mozes was born in Windwardside on Friday July 3, 1891. He had a sister Sophia born Wednesday April 25th, 1883 and a brother William born June 20th, 1885 and who died aged 20, June 24th, 1905. Mozes’ mother was Elvira Maxwell. He married on August 15th 1923 at the age of 32. His bride was Violeta Gonzalos Hassell aged 22. Her parents were Peter Hassell and Gwendoline Gordon. THEY were married on Thursday August 30th, 1900. Peter was then 33 years old and Gwendoline was 20. (Strictly young women for those guys!). Gwendoline’s parents were John George Gordon (his mother was Johanna) and her mother was Margaret Granger (her mother was Margaret Granger as well). Gwendoline was a sister of Charlotte the wife of Isaac Hassell . On Thursday January 13th, 1876 John George Gordon (19) married Margaret Granger (19). As for Violeta’s father Peter I did not get anything on him as there are so many men with that name in the registers that it would require too much time. So if more family records are required then go to the site wie.was.wie.nl and it contains all the information you need to build a family tree. To the family of the deceased my deepest sympathy to all of you who have lost a beloved mother and grandmother and I have lost a good and lifelong friend. And to my friend ‘FREDA’ may you rest softly.